Hard disk drive | Is This Thing On? All your home computers can access any files or data that you’ve stored there, over an a fast local network. All of your data and files are backed up redundantly, to multiple disks. These devices mirror (copy and synchronize) files across two or more hard disk drives. They’re designed so that if one disk goes bad, all of your data is still OK, and you can replace the bad drive while the device is running and fully functional. You get a lot of headroom in terms of storage capacity. Many of these devices allow you to store petabytes (a shiz ton) of data. I set up my NAS with two 500G drives, and proceeded to copy over my 20-year old CD collection (in MP3 format), all of my photos, and a lot of other important data. I have multiple computers, on various operating systems, in various rooms at my house, and they could all access my music and photos over both wireless and wired connections – it worked pretty well for a while. Then one day, one of my drives went bad. I got on Amazon, searched for one of the drives on the very specific compatibility list the vendor published, found, purchased and installed it. It worked. I hot-swapped the drive for the bad one and everything continued to work great. Being a generally paranoid person, and having experienced pains in this arena before, I also wanted all of my stuff backed-up somewhere outside of my house. So I shopped around, and decided to use the Memopal service. There were a number of nascent services coming on to the market at the time, and theirs seemed the most reputable and solid. I set things up so that the Memopal software was synchronizing files from my NAS to their cloud, set the account to auto-renew yearly, and for the most part left it alone. There were a few times when I checked on it, or when I had to fuss with their software to get it to work again, but otherwise it seemed to work pretty well. Years went by, and in the last three years I got more and more busy with the start-up I helped co-found, BigDoor. My personal email queue was the last thing on the list to maintain, unfortunately. A couple of weeks back, a very unlikely event occurred: both of the 500G NAS disks had problems. The manufacturer of the device, Infrant, was purchased by Netgear in 2007. I’ve been working with their support on this issue, and have high confidence that I’ll be able to recover my data after spending more money. Their support has been pretty good so far, and I’ll report back here if it goes south. 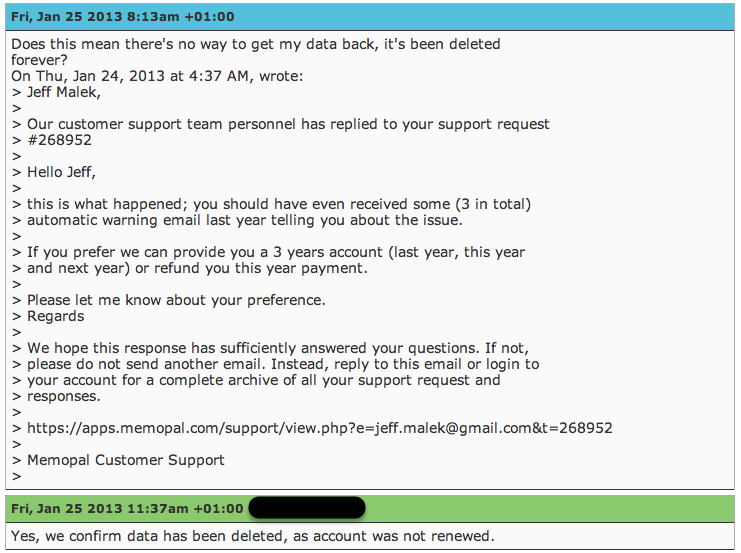 On the flip side, when I contacted Memopal support, I learned that even though they’d taken my money last year and this year via auto-renew, since I didn’t enter the licence code into their software last year, all of my data was deleted and can’t be recovered. 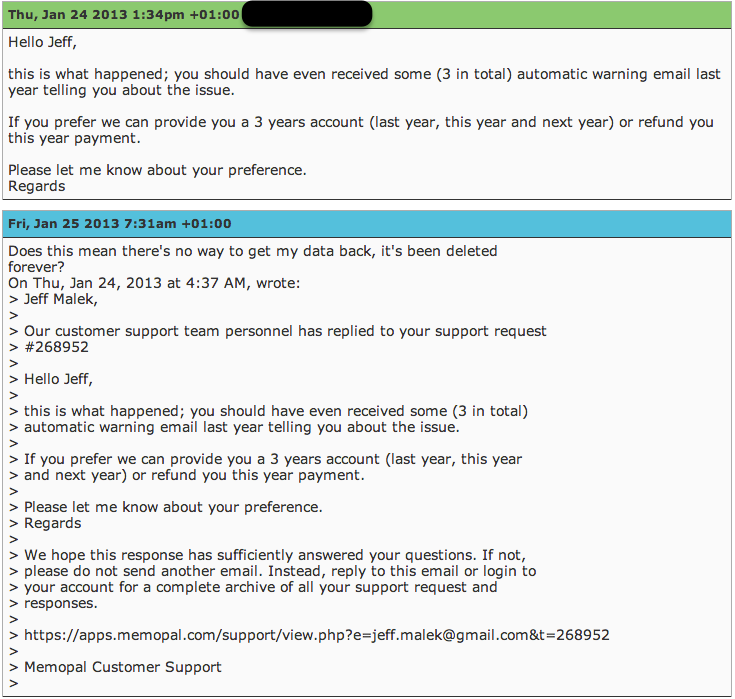 This approach is new to me; I’m used to the standard “if you pay for something, we’ll at the very least not destroy what you’ve paid for” vs. “to prevent the irreparable deletion of all your data, it’s not enough just to pay us, you have to put the code we emailed you into our software”. Below is the support thread, in case you’re as incredulous as I continue to be. With product decisions like this, it’s no wonder they’re getting their asses kicked by Dropbox and other new services. I’m curious to hear if you can think of a good reason why an online data back-up service would collect payment, but then delete your data (without reasonable warning), because you didn’t enter a licence code. 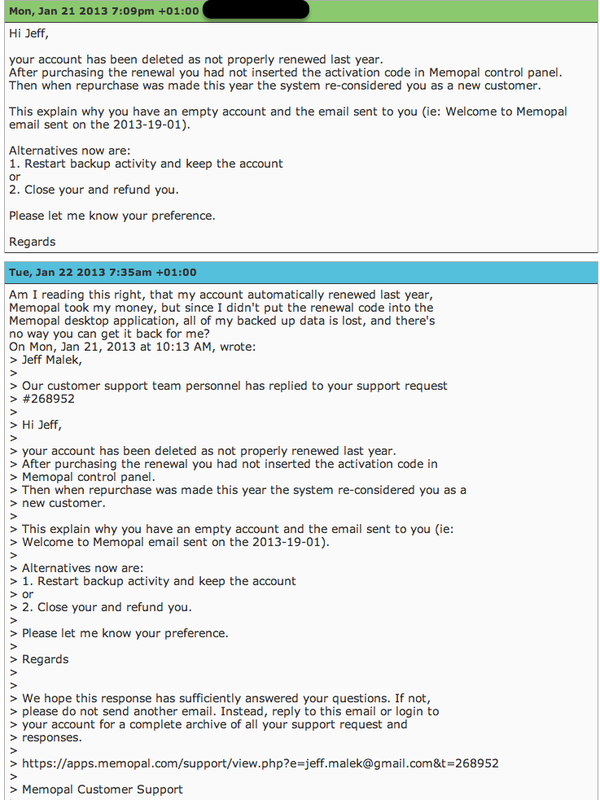 2/1/2013 Update : fairness in reporting; below is how their customer service responded. Amazing.